One of his earliest memories was when Mike Addams was only nine, he found himself backstage with the “King of Rock and Roll” Elvis Presley at a live Daytona Beach show. Little Mike probably never thought that in another nine years he would begin a 48-year career in broadcasting, with 40 of those years spent in Boston. Going on the radio at age 18 at WROD in Daytona was a way to pay for college and have some fun at the same time. 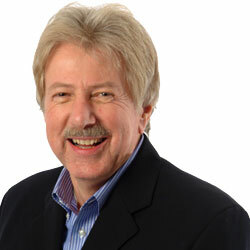 His career took him to Atlanta, where he worked at WFOM and WQXI. He was headed for law school at Emory University until Uncle Sam said “we want you” on New Year’s Eve 1970. After the army, Mike did afternoon drive and worked with Jay Thomas at Big WAYS in Charlotte. During the summer of 1973, Mike’s career headed him in a different direction, north! RKO General National Program Director Paul Drew heard Mike and recommended him for a job at the Big 68 WRKO, where he worked with Dale Dorman, Harry Nelson and J.J. Wright. It was at WRKO and the days of the teen idols such as Donny and Marie and Shaun Cassidy, that 16 Magazine dubbed Mike the 6th Bay City Roller! In the early 1980s, Mike became the program director at WROR, but it was more exciting to be back on the air at WHDH with Tom Doyle. He then did mornings at WZOU and WODS. In 1994, along came Greater Media. That company’s Don Kelley, who today is the President of the Massachusetts Broadcasters Hall of Fame, thought that Mike and Morning Magic would be a good fit, but initially Mike disagreed. After retiring in 2013 as the host of Morning Magic, Mike admits Don was right…they were 17 very Magical years!